I am always trying to come up with new snack bites for my clients. The snack bites are requested every week. Sometimes it can be a challenge to come up with new flavors. I had made some of my Raspberry Chocolate Hazelnut Snack Bites and it got me thinking of making some other type of fruit snack bites. That is how I came up with the Blackberry Coconut Chocolate Chip Snack Bites. Combine blackberries, coconut flour, oat flour and Date Paste. Process until creamy. Add chocolate chips and pulse until chocolate chips are chopped. Transfer mixture to a large bowl. Add rolled oats to the blackberry mixture and stir until oats and blackberry mixture are well incorporated. Roll into walnut size little balls. Freeze for about 15 minutes to firm up the snack bites. These little bites keep well in the freezer or in the refrigerator in a sealable container. Hi Kris. These are a fun color aren’t they? 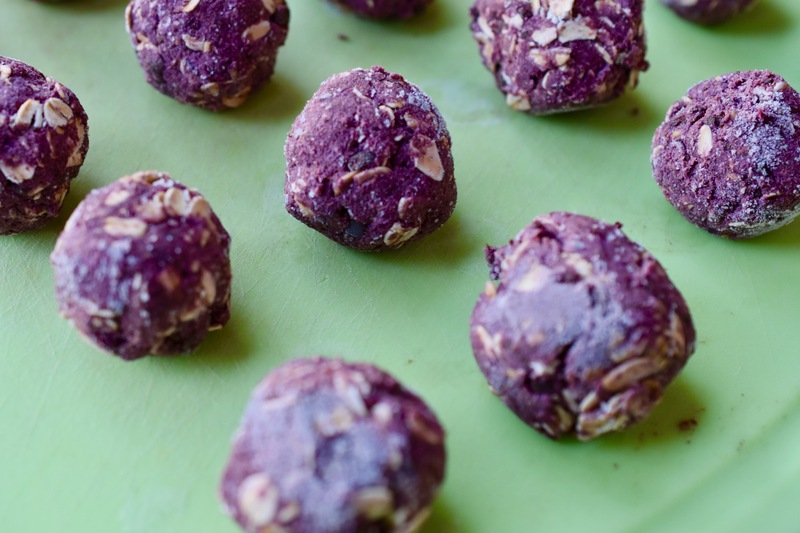 There is lots of nutritional goodness in these colorful bites. Thanks for stopping by Cathryn’s Kitchen. These look mouthwatering! Great ingredient choices! Thanks 40andfeelinit. I really liked this combo of ingredients myself. Thanks for stopping by Cathryn’s Kitchen.